Low energy, fatigue, lack of appetite, tingling and numbness in the extremities, light-headedness, or abdominal pain may all signal low levels of vitamin B12. Vitamin B12 is a key component in the composition of red blood cells, which carry oxygen throughout the body. When blood is low in red cells, symptoms like those above can result. Fortunately, it is easy to supplement the diet with vitamin B12 lozenges to counteract the deficiency. Vitamin B12 deficiency can occur for several reasons. First, as we age, the intestines do a less-effective job of absorbing nutrients from the food we eat. Second, primary food sources containing vitamin B12 are meat, eggs, and dairy; therefore, vegans and vegetarians are at greater risk of developing a deficiency. Third, those who have had gastric-bypass surgery or other procedures involving the digestive tract may see levels decline. Supplements like multivitamins often contain B12, but usually it is not absorbed well in this form. Though injections are effective, they require a doctor’s office visit and are painful. Researchers have concluded that sublingual (“under the tongue”) delivery is a very effective and inexpensive means of delivering the vitamin. When placed under the tongue or between the cheek and gum, the lozenge dissolves and releases B12 into the bloodstream in as little as 15 minutes. 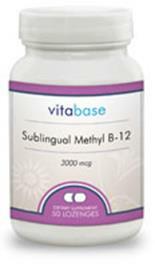 Vitabase Methyl B-12 uses the coenzyme form of B12, methylcobalamin, the most bioavailable and active form of B12. Most supplements (including one widely advertised on TV) use cyanocobalamin, which the liver must first convert to methylcobalamin. Suggested Use: As a dietary supplement, adults take one (1) lozenge daily, or as directed by a health care professional. Allow lozenge to dissolve in the mouth. Store in a cool, dry place and away from direct light. Other Ingredients: Fructose, mannitol, sorbitol, dextrose, natural cherry flavor and luo han guo fruit extract (May contain one or more of the following; magnesium stearate, vegetable stearin and silica). Methylcobalamin is the coenzyme form of Vitamin B-12 and is the form that exists in the body. Most other forms require some amount of conversion once they are consumed; methylcobalamin needs no conversion. It is the most active and effective form. Contains No Added: salt, dairy, yeast, wheat, gluten, corn, soy, preservatives, artificial colors or flavors. · Improved energy: Because of its role in red blood cell production, taking vitamin B12 may help improve energy levels. · Memory and mental sharpness: Vitamin B12 plays a key role in the nervous system’s function.